A long time ago in Europe, ages were pretty Dark. The distribution of wealth back then left a lot to be desired. Greedy people banded together to take things from other people so that the rich could get richer and the poor could have even less. Twas ever thus. Step into the middle of the normal state of human affairs as a Baron or Baroness somewhere almost in Europe a long time ago. Thanks to your birth you have a lot of little people working to make you richer, and you, in turn, are doing your best to make your king even more prosperous. If you do things right, you might someday be king. Each player starts with a Fiefdom Management card, divided into 64 squares (49 of which can have tiles played on them). Into four of these squares you deploy your Keep, in which you will put your fortification of some sort, and your soldiers. 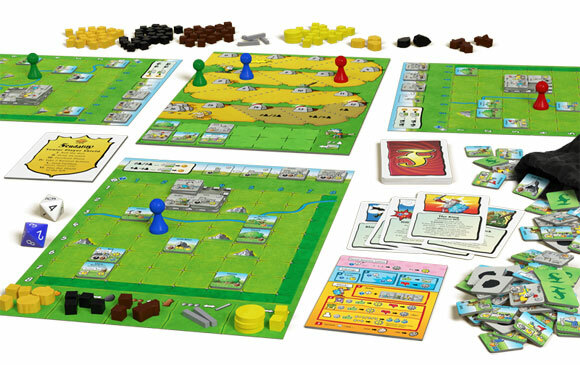 Elsewhere in your land you deploy assorted resource gatherers and buildings in an effort to grow, prosper, and score victory points. Along the way there may be wars, invasions, tournaments, taxes, and a lot of other nonsense. Eventually the game ends and the player with the most victory points will be the winner. This is one of those games that comes along and you dont know what to expect and then it turns out to be a gem. This is one of the easiest games I have ever taught anyone to play the game is fun and no two are ever the same. The random events can change the game at the start of any players turn taking you from leading to last place. The random rolls for the gaining of resourses is truly done very well with the possibility of ganing extra stuff when rolling eights or doubles. This is also the way to get victory points. Each player then gets he/her choice of any tile to gain the resourses from it and then can either attack another kingdom or a player or simply go visit the king or queen to gain or lose a victory point. Add a Review for "Feudality"